Pixie Helps Travellers Keep Track of Their Gear, and Sanity, While on the Road With a New Luggage tracker app | OhGizmo! By David Ponce on 08/29/17 • Leave a comment! Pixie just became the perfect travel companion. 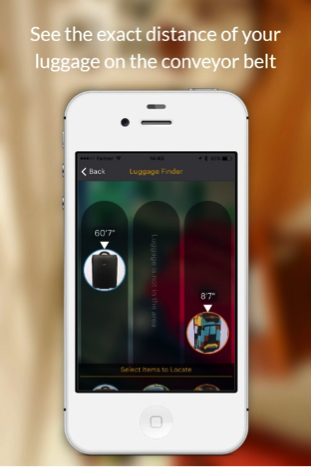 Now a smart luggage tracker, Pixie is just getting smarter and smarter. This time, helping travelers achieve peace of mind by providing you with a way to breeze through the airport and even help prevent luggage theft… Basically, it allows you to eliminate the hassle of airport bag mix-up at the conveyor belt using the Baggage Claim App. Finally, the answer to a problem that affects over 24M bags every year (Sita, 2017) many of them “accidentally” taken by others at baggage claim. We think that the release of Baggage Claim, came just in time for the holiday season. Many are still flying off to their dream vacations or taking well deserved weekend trips and many more will soon travel to celebrate the holidays and Pixie is the perfect companion. Statistics show that the average American spends two and a half days looking for items they lost or misplaced. Apparently, the amount paid to replace these lost items adds up to a whopping total of $2.7 billion a year. The most commonly misplaced or lost items are house or car keys. Whether we admit it or not, this has happened to us. Misplaced or lost, there are things that we just can’t find, so we end up replacing them. And we spend hours to trying and find them, and we have all been late to work or school because of searching for these things. This is where Pixie comes in. In case you didn’t know, Pixie helps find missing items so you don’t have to waste time looking for them or, buy replacements. Pixie is a smart tracker and the only one of its kind that can not only show you where your lost items are, but can accurately guide you to them. 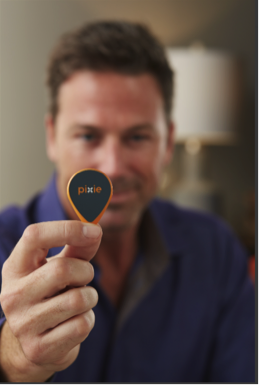 Powered by a patented technology and augmented reality, Pixie delivers unprecedented accuracy and the concept is similar to the popular mobile game Pokémon Go as both use augmented reality, making the process exciting as well. You will first need to Pixify items. Pixie is a mobile app for iOS devices that helps you find everything from keys, wallets, remotes and any other item that you want to track. – SCAN IT – similar to taking a panoramic photo, you will scan the room and the Pixie app will map the environment to locate the lost item. 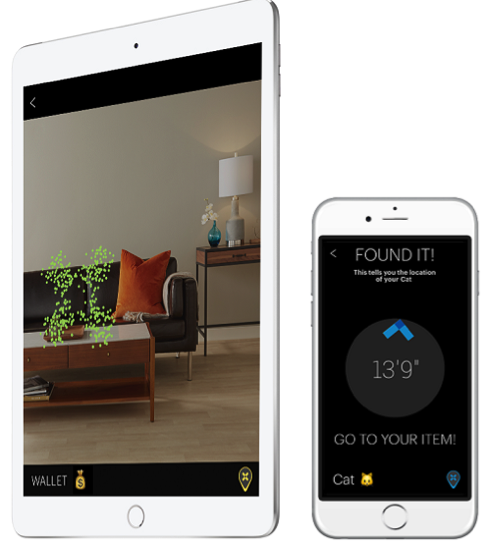 – SEE IT – Pixie will show you exactly where the item is in a room. You get these precise location tips thanks to the Pixie Pointer. The pointer is basically an arrow icon that will show you the direction and distance of the lost item from where you stand. The technology behind Pixie, including Pixie Dust and Pixie Pointer, is so advanced that it will even allow you to locate items through walls and objects in cases where the object is hidden under say a cushion, a stack of books, inside a drawer and even in an adjoining room. – HEAR IT – When you are within five feet of your lost item, the app will zero in on a target like a metal detector does and begin beeping to help you find your item. The Pixie app has an outdoor range of up to 100 feet and an indoor range of approximately 30 to 50 feet. Pixie has its own signaling technology that makes it possible to add hundreds of additional services. The Location of Things or LoT Platforms enables Pixie to add more functions such as the Baggage Claim App. Losing luggage can happen to almost anyone, it’s a common problem faced by many travelers – the safety of their baggage is one of the top concerns when traveling. Thankfully, a new third-party app called Baggage Claim allows travelers to travel without worrying about losing their luggage. 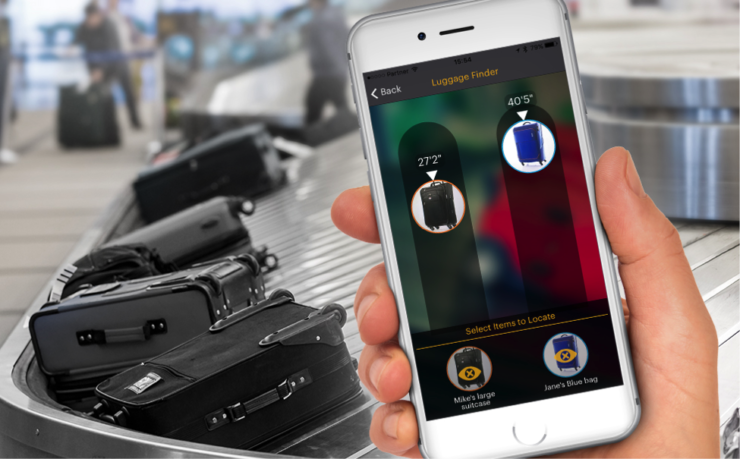 This advanced luggage tracker works with your Pixie Points and will alert your regarding the location and proximity of your bags. The Baggage Claim feature is the very first additional service to be added to Pixie’s LoT platform – and it’s free! This service is every traveler’s dream come true. Pixie’s Point tags will allow you to literally keep track of your luggage at the Baggage Claim carousel. Not only is finding lost items made so much easier, it is also a lot more fun. The augmented reality makes Pixie better than traditional Bluetooth trackers that rely on beeps, Pixie shows you where the items are including your baggage using an augmented reality interface. Locating your bags at the conveyor belt is done in real-time and is very helpful in avoiding the loss of your baggage. The Baggage Claim App works using the Pixie Points you attach to your luggage and once you are close enough to your luggage (ie: at the conveyor belt) but still can’t see your bag, the app shows you its location and even alerts you when you should get ready to step forward to grab it! With Baggage Claim App and Pixie Points, you can even name and add photos of every piece of luggage you Pixified, making them easier to recognize. Keeping track of luggage at the baggage claim is now made easy and simple. No need to scramble to the front of the carouse because Pixie will help you locate your luggage or bags. If you lose your luggage during the scramble to the carousel, get Pixie and open the Baggage Claim App and start locating your bags. If a worst scenario happens, like someone actually picked up your luggage, Pixie’s Baggage Claim App can be used to track your bags so you can rescue them. Mistaking similar looking travel bags can happen. It’s easy to pick up the wrong bag in a hurry and walk off thinking you have your stuff safe. When you have the Pixie App and the Baggage Claim in your phone, you can keep track of your stuff accurately. Baggage Claim tells you when your bags are in range, as far as 100ft. The item in your bag that you Pixified will be located, exact distance down to inches, using visual and audio cues. You will be shown how the bag is traveling, either towards you or away from you through a series of beeping sounds. Low pitched beeps mean your baggage is far and higher pitched beeps means you bag is closer. Baggage Claim was created to make traveling hassle-free as far as securing your bags and luggage is concerned. The app is optimized for most travel environments, but is especially designed to help users when in an airport. Download the Pixie App for Free. The Baggage Claim is free as well and you only pay for the Pixie Points coming in packs of 2 and 4.